Cyber Monday is a relatively new shopping holiday with origins dating back to 2005 as the ecommerce equivalent to Black Friday. During the early 2000’s, online retailers experienced a surge in sales on the Monday immediately after the Black Friday Weekend. This can be attributed to the fact that many consumers at the time looked for the best deals online when they got back to work the Monday after Black Friday, utilizing the faster connections they had at their workplace. Today Cyber Monday remains one of the biggest online shopping events of the year, taking place not just in the United States and Canada, but also in the United Kingdom, Brazil, Portugal, Germany, the United Arab Emirates, Egypt, Columbia and Japan. You don’t have to wait another 42 days for this year’s Cyber Monday on November 28th 2016, to take advantage of the savings you’ll find at World of Watches Cyber Monday Preview Sale taking place right now. 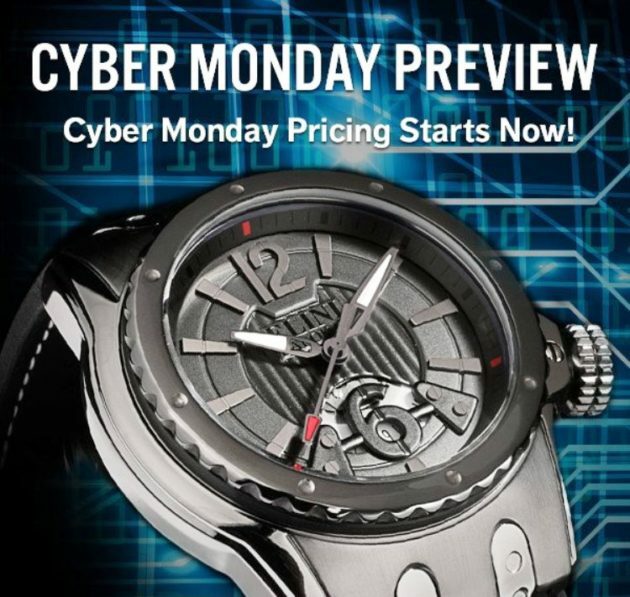 Over fifty-six of today’s most sought-after men’s and women’s watches are featured in the limited-time promotion at jaw-dropping Cyber Monday sale prices, including styles from Invicta, Michael Kors, Lucien Piccard, Gucci, Mulco, Bulova, Michele, Maurice Lacroix, Ebel, Movado, Hublot, Bulova Accu-Swiss, Ingersoll, Oris, PUMA and MOMO Design. 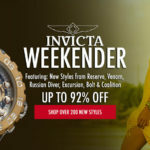 You’ll think you’re dreaming when you see our incredible Cyber Monday sale price on the Invicta I-Force Chronograph. This robust and masculine men’s wristwatch features the contoured round case in polished 18K yellow gold plated stainless steel, presented on a handsome black leather strap. The left facing positon of the crown and push-piece in polished 18K yellow gold plate adds distinction. The lattice-pattern white dial features small-second, 60-minute and 24-hour sub-dials, luminous sword hands, black Arabic numeral and baton hour markers. Features include quality quartz movement inside, water-resistance to 100 meters and a scratch resistant sapphire crystal above the dial. 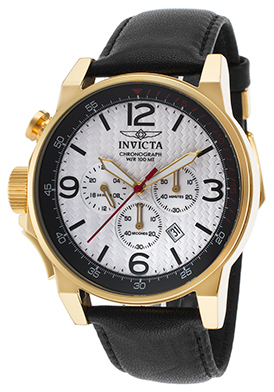 Invicta I-Force men’s chronograph is 46mm in diameter and 13mm thick. 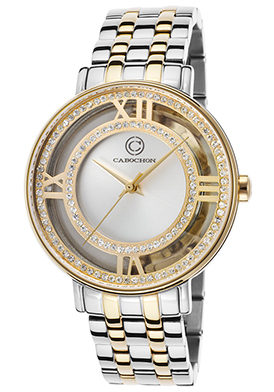 The Cabochon Carnaval women’s watch is one door-buster you don’t want to miss. This classic contemporary women’s watch features a crystal clear outer case surrounding the highly polished stainless steel case. Shimmering inlaid crystals are pave-set to glowing perfection on the perfectly round bezel rings in polished yellow gold-tone ion-plated stainless steel. The metallic silver colored sunray dial shines with yellow gold tone Dauphine hands. 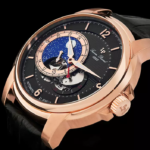 Features include a scratch resistant Sapphitek crystal above the dial, quality quartz movement inside and water-resistance to 50 meters or 165 feet. Cabochon Carnaval women’s watch is 36mm in diameter and 12mm thick. The Bulova Accu-Swiss Murren Automatic men’s watch is another outstanding buy. This premium-crafted Swiss-made watch features the contoured rose gold-tone stainless steel case with a lustrous polished finish, presented on an attractive brown crocodile-textured leather strap with a convenient deployment clasp closure. The striking brown sunray dial features an automatic date window at the 6 o’clock hour, rose gold-tone skeleton hands, Arabic numeral and baton hour markers. Features include a scratch resistant sapphire crystal above the dial with water-resistance to 30 meters or 100 feet. 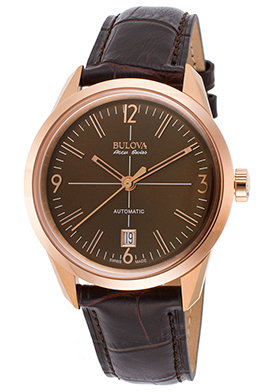 Bulova Accu-Swiss Murren Automatic men’s watch is 40mm in diameter and 10mm thick. The Gucci Bamboo watch is a chic and fashionable choice for today’s woman. This graceful women’s watch features the perfectly round case in highly polished stainless steel with a slim and slender polished steel bracelet featuring the signature Gucci horse-bit shaped links. Genuine white bamboo dramatically accents the perfectly round bezel and adjoining bracelet links. The metallic silver colored sunray dial shines with polished silver tone Dauphine hands, raised Arabic numeral and baton quarter hour markers. Features include quality Swiss-made quartz movement inside and a scratch resistant sapphire crystal above the dial. 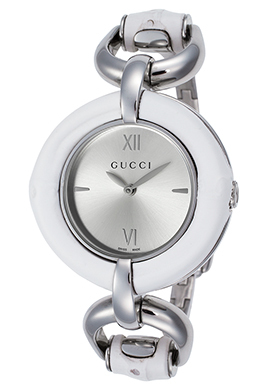 Gucci Bamboo women’s watch is 36mm in diameter and 9mm thick. Designer Michael Kors is a popular holiday favorite and the designer’s Jetmaster Automatic watch and Bradshaw chronograph are extraordinary selections for men and women respectively. 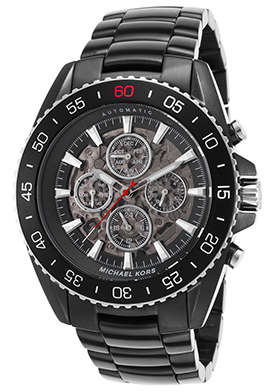 The Michael Kors JetMaster Automatic men’s watch offers a dynamic, polished profile for today’s man. The outstanding round case in polished black ion-plated stainless steel is presented on the matching triple-link bracelet in black ion-plated stainless steel with a satiny brushed finish. The unidirectional rotating bezel with a coin-edge rim and screened markers surrounds the skeleton dial with four sub-dials, luminous skeleton hands and hour markers. Features include month, day-of-the-week, date and 24-hour windows. An exhibition skeleton case back lets you see the intricate automatic movement inside. Michael Kors JetMaster Automatic multi-function men’s watch is 45mm in diameter, 14mm thick and is water-resistant to 50 meters or 165 feet. Alluring and at the fashion forefront, the Michael Kors Bradshaw chronograph is the perfect choice for today’s woman. The generously oversized case in polished yellow gold-tone stainless steel is presented on the matching triple-link bracelet in brushed and polished yellow gold-tone stainless steel with convenient push-button clasp closure. The raised, stationary polished yellow gold-tone bezel surrounds the black dial with small-second, 30-minute and 24-hour sub-dials, a date window, yellow gold tone hands, Roman numeral and baton hour markers. Features include quality quartz movement inside and water-resistance to 100 meters or 330 feet. 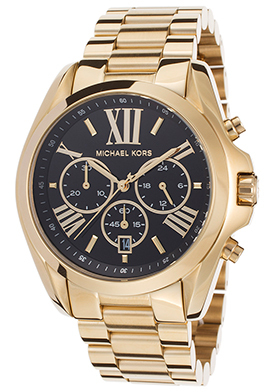 The Michael Kors Bradshaw chronograph is 45mm in diameter and 13mm thick. 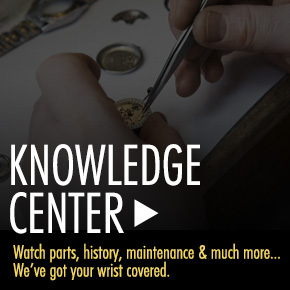 Be sure to Bookmark the World of Watches Cyber Monday page to take advantage of all of the advanced Cyber Monday deals you’ll find at World of Watches in the weeks to come. Christian Bernard Sale Now On at World of Watches: Huge Savings of Up to 85% off While Offers Last.